The Post newspaper headline announcing the shutter. Image shared on its public Facebook page. In a move that is being seen by some as politically motivated and by others as a long overdue necessity, The Post newspaper, Zambia's largest independent daily newspaper, has had their offices locked up and their printing equipment seized by the Zambia Revenue Authority (ZRA) because of outstanding taxes alleged to be at K68 million (US$6.1 million). 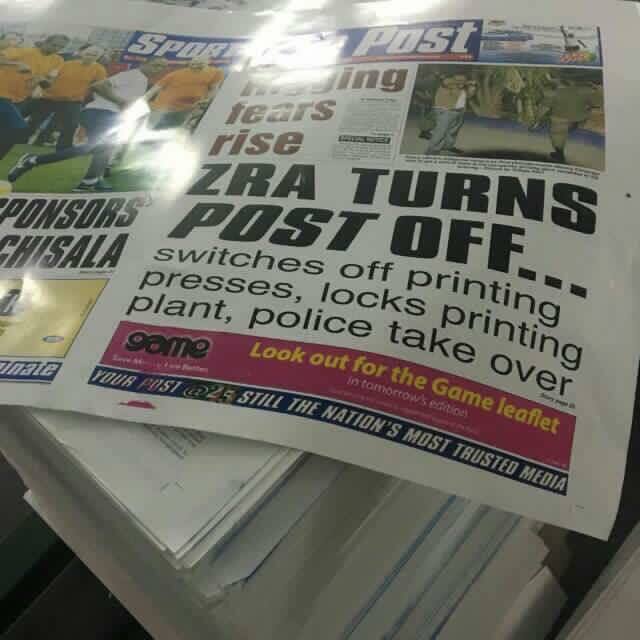 The newspaper announced on their Facebook page on June 21, 2016, that ZRA and police officers acting on the instructions of the president's office stormed their offices around 17 hours, demanding that The Post settles the outstanding amount immediately. The newspaper's general manager explained to the officers that the money in question had been settled almost completely, according to The Post's account of what happened. The officers, however, stated they had warrant of distress (which allows for the seizure of property and goods) that could not be revoked, even after The Post's lawyers produced a court order restraining the officers from issuing a warrant of distress. According to The Post, the officers then went ahead with dismissing all workers, confiscating equipment and locking up the premises. The newspaper is known for biting criticism against the government. Its editors and journalists have been locked up and taken to court many times by successive governments since it was established in 1991. Last year, bullets were fired at the newspaper's newsroom. No one has been arrested for the incident. There are at least two cases against The Post in the courts at the moment. Some people are suspicious of the timing. Zambians will be going to the polls to vote in general elections in August 2016, and the newspaper has been the main platform for the opposition candidates as the public media is owned and controlled by the government and the ruling party. However, some Zambians believe President Edgar Lungu and his government are doing what they must by taking action against The Post. That's job well done, I was almost voting EL out for not fulfilling his promise he made last year that he will get the money from the post back. Hard luck guys don't tak it personal! If really instructions are from state House, then state House is working, we need that money to buy medicines in hospitals. No one is above the law.Dont think you own zambia!! !if a poor marketeer can pay tax what of Me'mbe [The Post owner] ?this is justice congrates ZRA [Zambia Revenue Authority]. I had no idea the Supreme Court was situated at state house!!!! Once again, your theatrics and usual manner of playing victim at full play!!! If you're as good a citizen as you demand for just about anyone to be ” Just Pay”. Take time to understand taxation in Zambia you will realise how our tax laws crucify locals compared to foreigners. We should be ashamed, objective and non biased. This has nothing to do with taxation or we would have dealt with all those multinationals that cheat our country through transfer pricing everyday. This is sad that we can go savage on our own people. Zambian politics, cadres and lack of information. ZRA should never lie that only the post owes it money. u will understand that closure of the post newspaper is purely politically motivated wen u cross check the list of companies owing ZRA millions and are operational. Tampering with the media has been the beginning of arnachy [sic] in many lands and not the tax liability to the governments. just an objective observation. It has been reported that government-owned newspapers Times of Zambia, Zambia Daily Mail and the national broadcaster National Broadcasting Corporation owe ZRA over US$100,000. ZRA has never shut them down. This news is soul troubling. Even if the Post owes ZRA ,there ought to be better ways to requidate the debt.closing the company is not only vindictive but alas..it's also retrogresive.Think of the employees across the country as well as those of us who love reading the post. Closing down the Post Newspapers & the printing plant is surely not the way to do things in a quest to recover Governments statutory obligations. I personally don't believe closing the Post Newspapers was the best thing to have done. So many people have just lost a job. Besides government loses a lot of pay-as-you-earn [a form of income tax], and other taxes. Regardless of the political preferences we all got, it is a very bad decision by the government to temper [sic] with press freedom especially in an election year like this one. I am extremely disappointed.